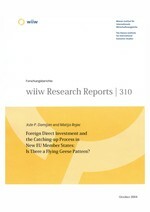 The paper aims to verify the existence of the Flying Geese Model (FGM) in the case of inward FDI in Central European Countries (CECs) which are new EU member states; more precisely, to find out in what way and to what extent FDI has contributed to catching up, i.e. to the restructuring process and to productivity growth in CEC manufacturing. The analysis shows that FDI is an important if not the main vehicle of manufacturing sector restructuring and productivity growth in the analysed CECs, along the lines of FGM. In terms of technological intensity, foreign investment enterprises show better structure and faster and more promising restructuring trends than domestic enterprises. Restructuring processes in domestic enterprises are slower. Productivity growth in CEC manufacturing is positively correlated with technological intensity and the level of foreign penetration; the higher the technological level and the higher the foreign penetration, the higher the productivity growth. However, high foreign penetration has a negative impact on productivity growth in high- and medium-high-technology industries. The latter is in line with the criticism of the FGM, maintaining that catching-up via FDI along the lines of FGM is going on mostly in industries at the lower end of the technological intensity spectrum (i.e. at earlier stages of host country development) and less so when it comes to industries at the upper end of the technological intensity spectrum (i.e. at later stages of host country development). The FGM seems to have problems in explaining the catching-up process at more advanced stages of host country development. Also, new EU member states could not rely to a major extent on FDI when attempting to catch up in technologically advanced industries and/or in more advanced stages of development. There, endogenous efforts are indispensable.